Look up the definition of “persnickety” in the dictionary and you’ll find “painstaking attention to detail.” Melissa Weiler lives by those words, which is why she decided to keep the original name of the York business when she took over the reins in 2008. She celebrates 10 years of ownership this year. The shop, located in Olde Tollgate Village, was once a gift shop that included a stationery department. “When they sold the stationery side of the business, we decided to keep the name, since we are perfectionists,” she says, explaining that “invitation studio” was added to represent the shift in focus. Melissa learned about the opportunity to acquire the business from one of the owner’s daughters. “She was a friend of mine. Every year I’d send her an over-the-top Halloween invitation with a theme, so she was familiar with my work,” says Weiler, who graduated from the Bradley Academy of the Visual Arts. 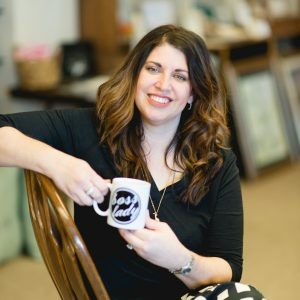 When word got out about Weiler’s talent, creativity, and attention to detail, she quickly earned a reputation as one of the region’s premier invitation designers. Weiler specializes in working with a wide range of budgets to transform ideas into reality. 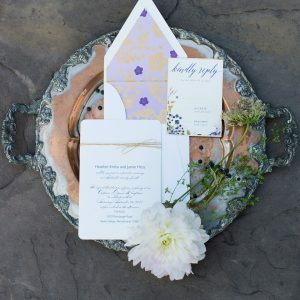 Offerings run the gamut from save-the-date pieces to invitations, menu cards, gift bags, seating charts, ceremony programs and signage, to name just a few. 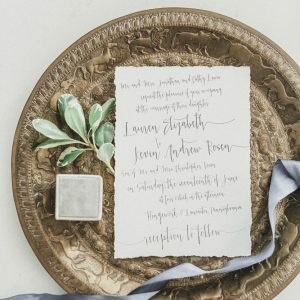 Wedding designer Susan H. Moran describes Weiler’s work as “exquisite” and is especially impressed with Weiler’s ability to take any concept and develop it into a full-blown design while working within a wide range of budgets. Carol Introna, as a mother of the bride, called upon Weiler to assist with a paper suite for her daughter’s wedding. 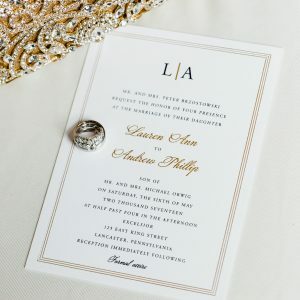 “I love the pretty things in party planning—banners, menus, favors, stickers, you name it,” says Introna, who purchased the wedding invitations from a catalog and then asked Weiler to customize them to meet her needs. She also used Weiler’s services for place cards, menu design and other pieces to tie it all together. Introna expressed appreciation for the customized attention to detail and the guidance Weiler offered. “She held my hand through the entire process and gave me ideas, and everything just flowed, from the rehearsal dinner, to the wedding, to the morning-after brunch,” says Introna, who continues to use Weiler’s services for other celebrations like birthdays and christenings. For Weiler, it’s all part of doing business, and she looks forward to helping customers strategize. “People like the one-on-one,” says Weiler, who offers a free 90-minute consultation for those who are considering using her services. Those visiting the studio can browse through catalogs and gain inspiration for additional ideas by viewing some of the custom work on display throughout the 1,300-square-foot studio. One point of pride for Weiler is an award she won several years ago for a card she created for her mother-in-law’s 80th birthday. The LOUIE award has been described as the Oscar of the paper industry and recognizes the most outstanding greeting cards, invitations, and announcements marketed in the United States. “She is a watercolor artist and her name is Rosemary, so we scanned a painting of roses and designed a card for her,” explains Weiler. A panel of 18 judges chose Weiler’s piece from among 1,000 entries submitted from around the world. Weiler puts a priority on staying up to date with current trends and with her ability to read people’s personalities; she provides a unique service, tailor-made to each individual. Much of it is intrinsic, having succeeded in the business for a decade now, but she also depends on her talented staff to work on things like social media. These days she’s enjoying experimenting with new technology, like the iPad Pro Apple Pencil. “I really like it for an authentic watercolor look, and the best part is that you can erase mistakes,” she says with a chuckle. Her recipe for success is hitting the sweet spot at the intersection of creativity, work, and fun. “Everyone is celebrating something, and I think the best part is getting to know the customers and share that joy with them as they move through various milestones in their lives,” she says with a smile.